Networks may be closed (bound) or open (unbounded), web-based or located within a specified geographic area. Purposes can include information sharing, mutual support, and advocacy for social, economic, environmental or political change. In this example, the ILAC Initiative used the SNA approach to develop a system for monitoring the evolution of a particular research network, commissioned by a large research program. The project team developed a survey asking members of a newly formed research network to identify partners with whom they had worked with in the past year or so. The survey also asked if the collaboration (formal or informal) was a consequence of the newly formed research network. The information collected was processed with Excel and the UCINET software. With the analysis of the data and maps, the project team was able to develop a baseline for supporting the M&E strategy of the research program who commissioned the study. 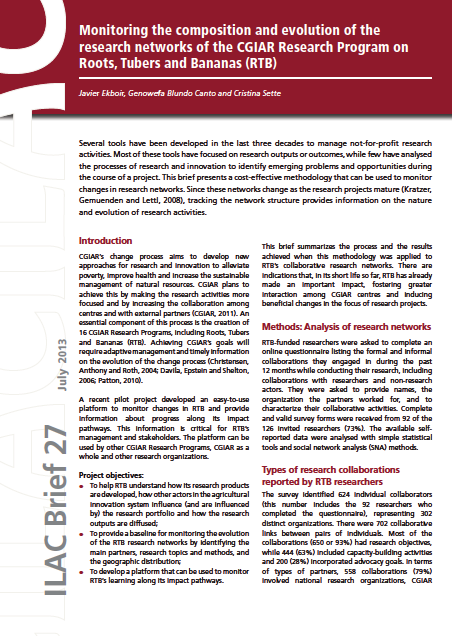 The characteristic of the network, including the characteristics of its members, their affiliations, disciplines, geographic distribution, areas of work and types of research conducted, to name a few, are likely to evolve with time as a consequence of the adjustments in the research collaboration and outcomes. The research program that commissioned the SNA study will monitor the evolution of the network by applying the same questionnaire and methods, on a periodical basis. In this example, the Independent Evaluation Group (IEG - part of the World Bank Group) have used a network analysis to gain a better understanding of the role of the World Bank Group's policy interventions in the health sector in Liberia in the context of many other organisations and interventions. The blog presents two network diagrams: The first SNA diagram presents the role of the WBG as a financier of the health system of Liberia, in relation to other types of organisations. The colours and size of the bubbles denote the type of organisation and the size of annual budget for health in the country. The second diagram looks at the perceived knowledge leadership of different organisations in the health sector. Read more. A network diagram is made up of a set of nodes and lines that connect those nodes. Usually a product of social network analysis, a network diagram is the visual display of how people (or other elements) in a network are connected. The article by Rick Davies was produced for the Communication for Social Change Consortium. It presents an introduction on social network analysis (SNA) and how it was used in M&E practices, in different fields. It also discuss limitations and opportunities of using SNA. This background note from the Overseas Development Institute (ODI) provides a detailed discussion of networks, including a broad definition and a description of their purpose and use. This is a one-page guide to Social Network Analysis. It provides a brief overview, practical tips for using the technique, and a list of resources for more information. This software from CYRAM allows the user to analyse social network data both visually and interactively which allows the detection of underlying structures and patterns. Netdraw is a free Windows based program that can be used for visualizing social network data. Tulip is a program that has been designed to assist with the analysis of social networks through visualisation of data. Inflow 3.1 is a software package that allows you to analyse network data and create visualisations of the results. The graph represents a network of 1,188 Twitter users whose tweets in the requested range contained "#eval", or who were replied to or mentioned in those tweets. The network was obtained from the NodeXL Graph Server on Wednesday, 20 January 2016 at 12:20 UTC. The requested start date was Wednesday, 20 January 2016 at 00:01 UTC and the maximum number of tweets (going backward in time) was 5,000. Thanks for the links, Larry. We've now added these to the resource list on the right hand side. PARTNER is a social network analysis tool designed to measure and monitor collaboration among people/organizations. The tool is free sponsored by the Robert Wood Johnson Foundation) and designed for use by collaboratives/coalitions to demonstrate how members are connected, how resources are leveraged and exchanged, the levels of trust, and to link outcomes to the process of collaboration. The tool includes an online survey that you can administer to collect data and an analysis program that analyzes these data. By using the tool, you will be able to demonstrate to stakeholders, partners, evaluators, and funders how your collaborative activity has changed over time and progress made in regard to how community members and organizations participate. AEA has a Social Network Analysis TIG that evaluators who are members of AEA might be interested in. Here is the link. We are in the beginning stages of developing the TIG and our TIG membership.